"Package contained everything needed for install included extra zip-ties for tucking wires. Unit itself was extremely easy to install. All plug and play, no splicing wires at all and it is completely standalone so no other units are required to function. Instructions were easy to read and fairly easy to understand. The sensor bolts right up to shifter with supplied bolts and washers, no need for new shift rod. Bluetooth connectivity was painless and the android app was very easy to use. Lot’s of adjustable parameters." "The installation process was very simple, taking me around 50 min to install. We decided to test the QSE on our CBR. 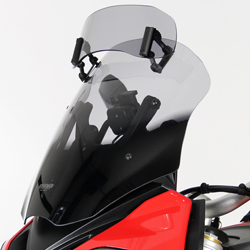 We have ITR Componentes T2 rear-sets on our test bike. We set the sensitivity to 12NM. Fine tuning the cut-off times takes some time but the beauty is that it can be done without getting off the bike. I noticed a positive difference immediately when doing my first test lap. I decided to shift at 10 000 RPM in each gear. The shifting itself was extremely smooth and the shifter did not miss a single shift. 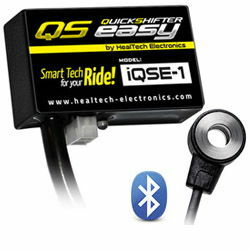 The HealTech QSE compared to other shifters I have ridden with in the past, is on a whole new level. I really enjoyed the adjustments you could make over the different RPM ranges. In my personal opinion this feature makes it extremely smooth and allows short shifting. 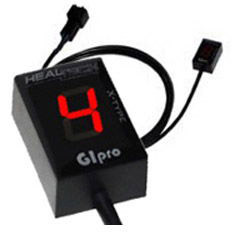 This feature is especially ideal for shifting at optimal RPM ranges. The shifter is precise and accurate unlike many other shifters I have tested. I thought it would be a good idea for a less experienced rider to test the QSE to see if someone with less riding experience would be able to notice a difference. In his own words he said “this is the smoothest quick shifter I have ever used.” – which sums it up for itself. When testing the QSE on the road I noticed the same results. The shifter was still precise and accurate. Even when shifting at ~5000 RPM from first to second, the bike still went into gear like a knife through butter. Overall I am extremely impressed with this quick shifter and the unique attributes the product possesses. From a technological aspect, the smart phone application available to configure your quick shifter – is really a step in the right direction and I can honestly see this product as a market leader. Well done to the whole HealTech team!" !quote, electronics, air, shifters, airshifters, pan, european, quick, shifters, qse, qse-1, qse-2, crf150r, crf150fr, st1300, st1300x, 599, 919, cb600s, 650, cbr, cbr650, cbr650fa, dn01, fire, blade, fury, nc700xd, sabre, silverwing, vfr750, 95, 96, 97, 98, 99, 00, 01, 02, 03, 04, 05, 06, 07, 08, 09, 10, 11, 12, 13, 14, 15, 16, 17, 18, 19, 20, 1995, 1996, 1997, 1998, 1999, 2000, 2001, 2002, 2003, 2004, 2005, 2006, 2007, 2008, 2009, 2010, 2011, 2012, 2013, 2014, 2015, 2016, 2017, 2018, 2019, 2020!